For Swedish companies, sustainability is a core value that also permeates the relationship with suppliers and throughout the supply chain. The Quality & Compliance Forum is a platform for member companies of the Chamber to discuss challenges and identify areas of collaboration that support competence and consistent quality-building to enhance businesses. Changes are also constantly taking place in administering regulatory regimes and simplification of verification of compliance with an aim to promote ease of business and create systems to upgrade industry to international standards. The Quality Council of India (QCI) plays a pivotal role in propagating, adoption and adherence to quality standards in important spheres that have significant bearing in improving the quality of life and well being and is an important stakeholder for directing concerns raised within our Forum. Mr. Johan Genneby, Managing Partner – Beyond Intent AB, a sustainability agency enabling businesses to measure, assess and develop initiatives that generate value for them and society, deliberating on sustainability and recent regulatory changes in Sweden/ EU. 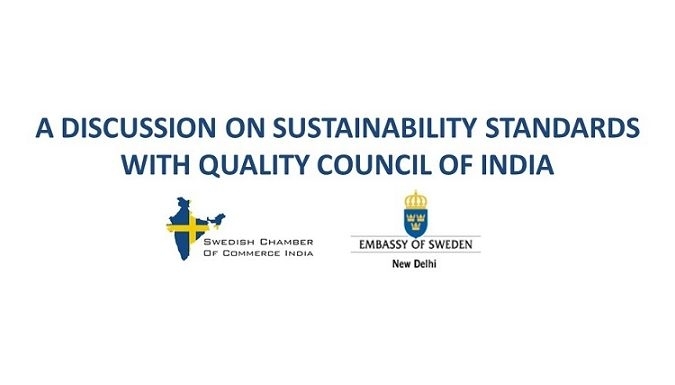 This session is being organized jointly by the Swedish Chamber of Commerce India along with the Embassy of Sweden in New Delhi. Please register here the latest by August 12.